When professional meme Danielle Bregoli made the decision to become a rapper, more than just a few eyes were rolled. After all, the 14-year-old is better known for her now infamous catchphrase ‘cash me ousside, how bou dat’ than for her musical abilities. We all assumed the Dr Phil clip would eventually stop doing the Facebook rounds, and we would all move on to a new love-to-moan-about reality TV figure. Eventually Danielle would fade from the public consciousness, reappearing every so often on a ‘Memes of 2017’ listicle where we would all learn how she’d given up her mum-baiting ways to help other troubled teens. 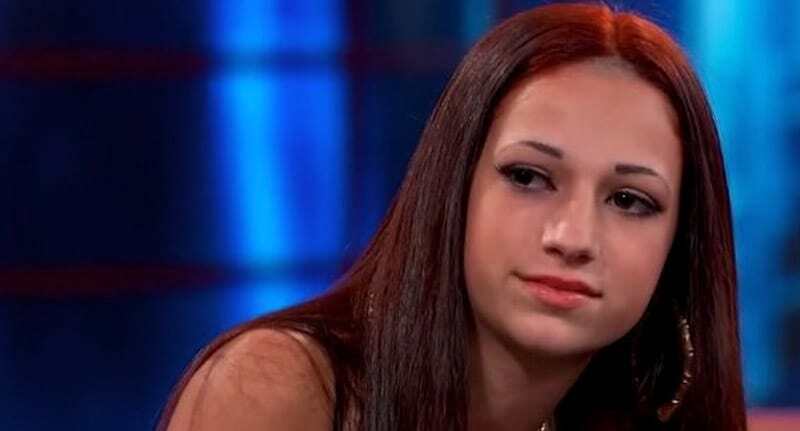 However, it appears the Cash Me Ousside Girl has instead turned her shoddy attitude into a profitable, and even admired, rap career with her new Bhad Bhabie persona. Bhad Bhabie’s oeuvre appears to focus on getting one over on the ‘haters’. To be fair, she has had a disproportionate amount of hate for someone who isn’t even old enough to buy party poppers. Her latest feisty singles, Whachu Know and Hi Bich, have dropped and people appear to be genuinely liking what they hear. Say what you want about @BhadBhabie but HER verses on Kodak Blacks beat > Kodak's verses, well, ever. One Twitter user described her as ‘extremely talented’ while another described her as ‘my all time favourite singer right now’. @BhadBhabie is my all time favourite singer right know and hate me if u want I don't care ?❤️?? Her double feature video for Whachu Know/Hi Bich involves her literally being put on trial before being electrocuted. Although I doubt many states endorse capital punishment for bunking off school and stealing your mum’s car, it’s still a fairly memorable video.